It’s not often we get out to Sanford, but boy have we been missing out, Chef Nat Russell has been disrupting the dining out scene in the area by producing some of the best food we have experienced in 2017! 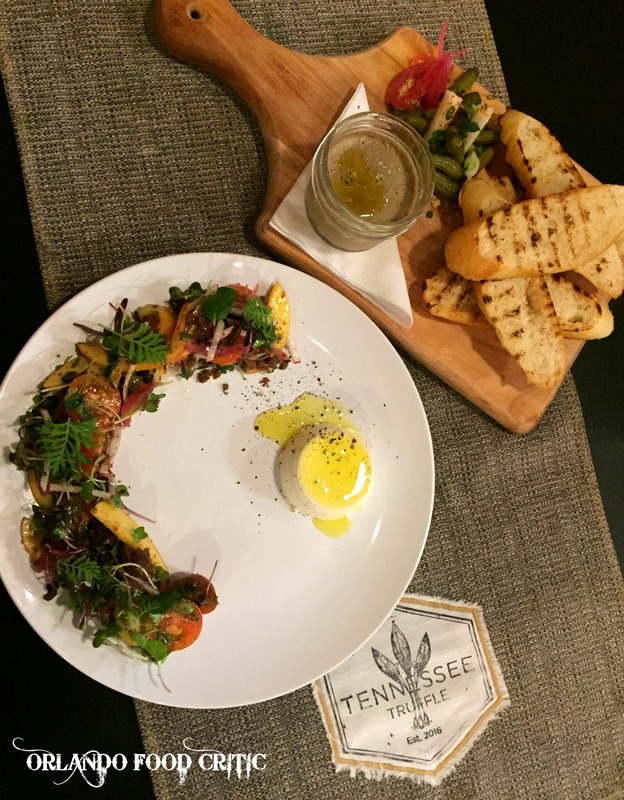 After honing his skills in prestige restaurants such as Luma and Café de France in Winter Park, Nat took the plunge and opened the Tennessee Truffle, first as a “Pop Up” and after phenomenal success, a full-blown restaurant. He quickly made a name for himself in the breakfast and lunch market with fans of his “Biscuits & Gravy” and Southern staples bombarding social media with rave reviews. Nat has now turned his attention to the dinner market to compliment this success, so it seemed sensible for us to visit on a cool Thursday evening this week. The Tennessee Truffle is a cozy and intimate restaurant, with brick walls, stone floors and theatre kitchen, we felt at home right away. Andrea our server met us at the door and from that time until we left was attentive, knowledgeable and downright friendly. Her knowledge of the menu and preparation was faultless, a great compliment to Nat’s team. Before we get to the food, we would just like to comment on what, (apart from the excellent food) sets the Tennessee Truffle apart from its competitors or indeed most restaurants. We can sum it up in two words “Passion” & “Interaction”. There exists in many restaurants a virtual barrier between the kitchen “Pass” and the customer, not so for Nat, he personally creates “Theater” and excitement with his dishes right at your table. As you would expect Nat uses local and authentic southern ingredients, smokes his own meats and creates amazing flavor profiles with innovative combinations and preparations. 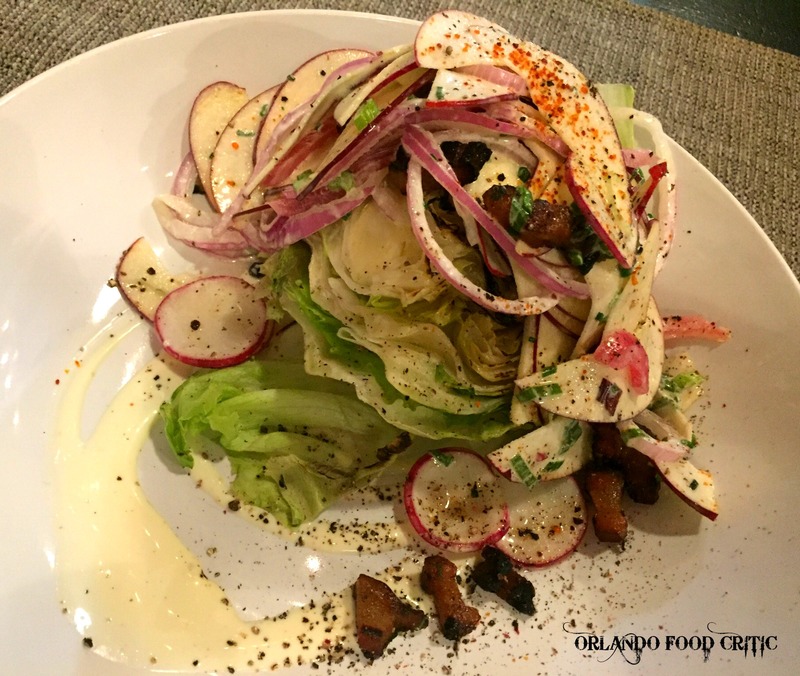 Southern Wedge Salad – Iceberg lettuce, charred radicchio, pink lady apple, shaved red onion, radish, 12-day house-cured smoked Duroc bacon lardons and buttermilk dressing. The smoked Duroc bacon was a truly stand out element of this otherwise simple dish, taking sixteen days to prepare, the dedication pays off in the depth of flavor. Southern Panzanella – Olde Hearth pumpernickel dust, arugula, heirloom tomatoes, fresh peaches, Humbolt Fog chevre panna cotta, garden mint, frisee with sherry dressing. Light and refreshing, beautifully presented. Chicken Liver Mousse – Bell& Evans chicken livers, pickled crudités, whole grain mustard and grilled Olde Hearth baguette. One of our favorites of the night, Nat uses milk to remove the harsh liver aftertaste associated with some mousse and pate preparations, the addition of a drizzle of Winter Park Honey and the attention to this detail delivers an appetizer worth the visit alone. 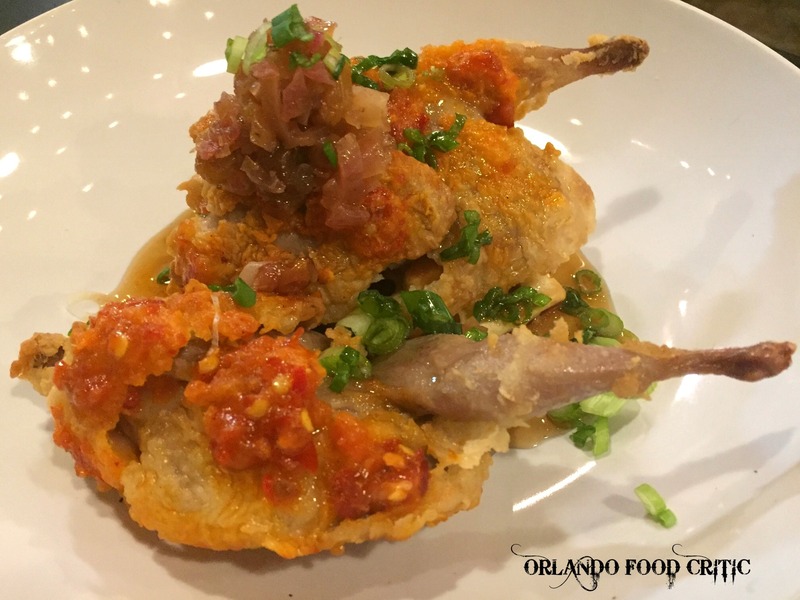 Nashville Hot Quail – Scallion Waffle, red onion chutney, smoked maple syrup. Nat’s version of Chicken & Waffles. Great succulent Quail, crisp tangy waffle, superb chutney, but the thing that sets it all off is the smoked maple syrup. Nat brings out a pot of freshly smoked house syrup and as the Hickory mist descends onto your plate you will find yourself wondering why no one has made this aroma into a Cologne (We did). Outstanding! 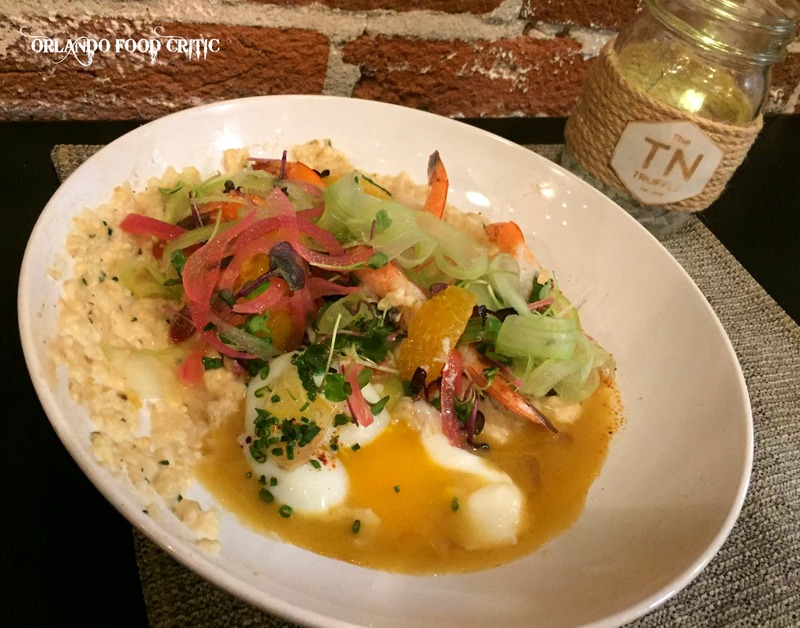 Shrimp & Grits – Grilled Florida shrimp, Antebellum Anson Mills grits, Lake Meadow farm egg cooked sous vied, orange & celery salad, shrimp cuisoin. Admission. We don’t really like Grits, but we “LOVED” this dish. Nat brings out the sous vied egg and you crack it onto a plate, flavor with varied salts and preserved lemon, then incorporate into the creamy Anson Mills grits. The shrimp are a tour de force on their own and the whole thing is sauced in a shrimp shell and orange reduction. Would order again & again & ……. Other dishes on the menu include a Maple Leaf Duck Breast, Grilled Ft. McCoy Flat Iron and Local Fish of the Day to name but a few. Plenty more to sample on our next visit. Dessert deserves a place on its own so will share in a couple of days with more details on Nat’s Amazing Tennessee Truffle. Our advice, go now whilst you can get a seat, this will soon become one of the hottest dining venues in central Florida and well deserved.